On June 26, the studio that brought you How to Train Your Dragon unveils an all-new Netflix original series that takes Hiccup and Toothless to the edge of adventure: DreamWorks Dragons: Race to the Edge! DreamWorks Animation and Netflix revealed the exact premiere date today, along with the first sneak peek at the exciting, action-packed opening credits. Jay Baruchel and America Ferrera who voice the two young Viking heroes in the feature film return to the television series to voice Hiccup and Astrid, and are joined by Christopher Mintz-Plasse and T.J. Miller who will reprise their roles as Fishlegs and Tuffnut in the series. In this new original series, Hiccup and Toothless lead the Dragon Riders as they soar beyond the borders of Berk and discover the mysterious Dragon Eye - an ancient artifact filled with secrets that will lead them to new lands filled with undiscovered dragons. But the heroes find themselves pursued by marauding dragon hunters, who will stop at nothing to seize the power of the Dragon Eye. Thirteen episodes of the all-new DreamWorks Dragons: Race to the Edge premiere exclusively on Netflix on June 26. Based on DreamWorks Animation's hit How to Train Your Dragon films, the new episodes bridge the gap between the first feature film and the much-anticipated sequel How to Train Your Dragon 2. Weaving a continuous storyline, the television series works in tandem with the feature films and DVD specials, allowing fans to delve deeper into dragon lore. 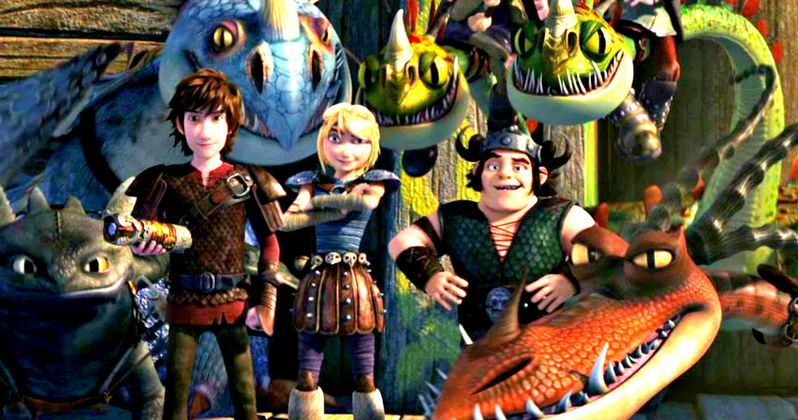 From the origin of Hiccup's new flight suit and the secrets of his dragon blade to the young Viking's budding romance with Astrid, DreamWorks Dragons on Netflix gives viewers rich details of the larger narrative with the introduction of new dragons, exotic places and worlds unknown. Take a look at the first trailer below, before this new season debuts on Netflix this June.